While pondering the purchase of his next Strat, a man with 22 Stratocasters is asked by his wife, “How many Strats are too many?” To which he replies, “23?” Obviously, one can never have too many Stratocasters. And every year, Fender Stratocaster fans eagerly await the release of a new Fender American Standard Stratocaster in anticipation of some changes from previous years that place them in the “must add to my collection” category. Usually, the changes are subtle. However, 2017 marked a larger change for Fender. Recognizing it was time to refresh the Stratocaster line, The American Standard series was retired and replaced by the Professional Series. The first question Stratocaster fans are asking is whether there are significant changes, or is this just a way to give it a fancier name and charge more? In short, the Professional series does present changes in the Strat that influence both tone and performance. The challenge for a company like Fender is to stay relevant with new generations of guitar players while continuing to appeal to seasoned fans. How do you make a $1,500 guitar appealing and worth the price difference from less costly models? 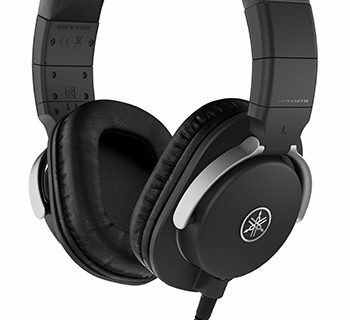 Special features like modifiable sound cards and automatic tuners have been seen more as gimmicks rather than true upgraded features, so you’re left with shuffling around the core components and specs. 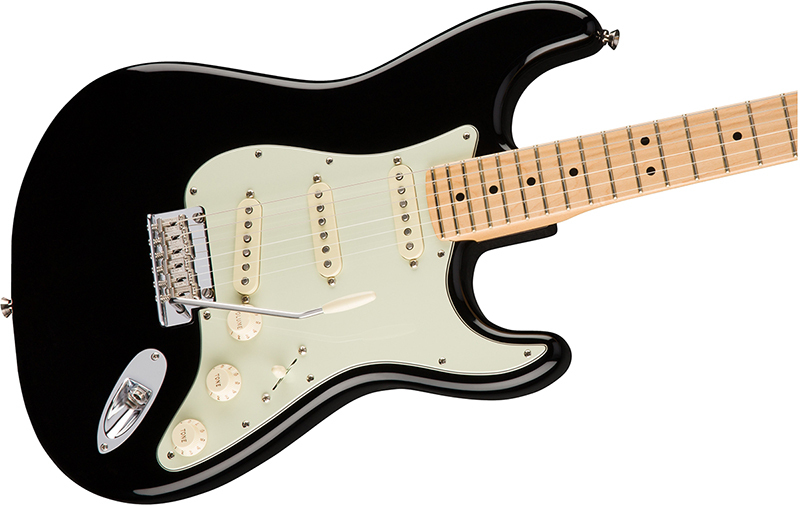 If Fender over-modernizes the Strat, they risk making it unappealing to Strat aficionados. If they make it too vintage, younger players will turn away. 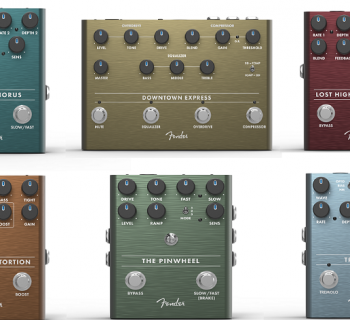 Overall, Fender has done a nice job upgrading its American Standard line to the new Professional series. Do the new features justify the price increase over the American Standard line? That’s hard to say. Bone nuts (one new feature) are not really costlier, while adding a treble bleed circuit costs perhaps a few dollars at worst. Changing the neck shape, pickups, and tremolo pop-in arm are a bit more involved, though. 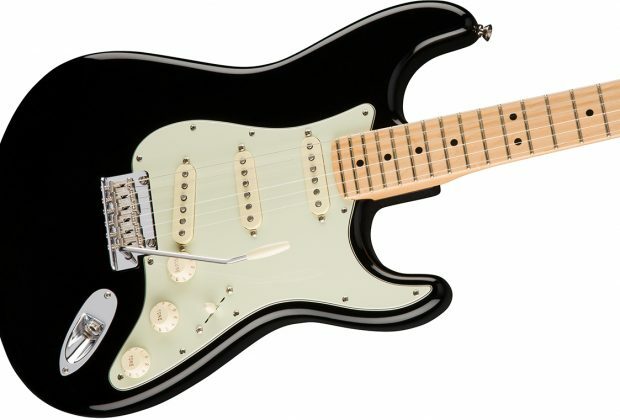 Whatever the case, this guitar is stage and studio ready, and sure to appeal to a broad range of players while continuing to deliver classic Stratocaster tone. The Stratocaster we reviewed featured a glossy, piano black body with a slightly tinted (not yellow) maple neck and fretboard. The back of the neck is covered in a matte satin urethane finish while the fretboard is covered in glossy urethane. The 22 frets have been changed from medium-jumbo to narrow-tall to improve bending and fretting chords higher up on the neck. The alder wood body (a common Fender body choice) is covered in gloss polyurethane. The headstock and badge are modern Stratocaster size, not the larger, vintage, ‘70s style. The tuners remain unchanged, a staggered modern style with a modern style string tree. The neck is a standard 25.5” scale as found on most Stratocaster models, with a 9.5” radius, but has a new, “Deep C” shape. The “Deep C” thickness is 0.82’” at the first fret and 0.920” at the 12th fret, but dimensions can vary slightly. The neck heel is a standard, four-hole, rectangular design. 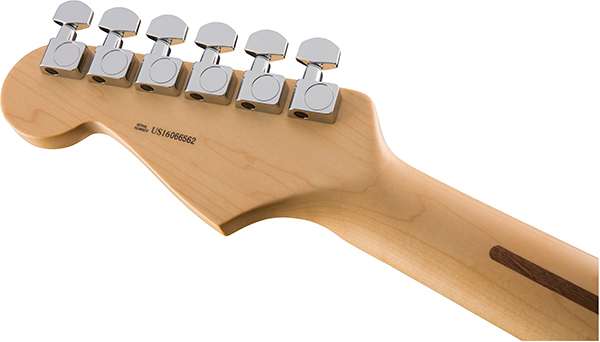 The truss rod is unchanged and continues to be a bi-flex dual adjust. This is a Fender exclusive that can correct not just concave neck bowing (like a single-action truss rod) but also correct for convex neck bowing. This feature has only been available on certain Fender models, and now it makes its way down the line into a standard production model. The pickups are new this year and have been changed from the custom shop, single-coil Stratocaster pickups on the Standard line to a new, Tim Shaw-designed, V-mod, single-coil pickup. The development and research behind the new pickups is well discussed on the Fender website in this blog post. With the American Professional Stratocaster, all three single-coil pickups vary, with a blend of alnico II and III for the bridge, alnico II and V for the middle, and alnico V for the bridge. The poles on the pickups are vintage staggered. There are many discussions of this design decision online and whether it is appropriate for modern day fretboards that aren’t sporting a vintage 7.25” radius. Another enhancement is the treble-bleed circuit, which compensates for the familiar loss of treble tone when rolling back the volume control. There is a standard, five-position blade switch for pickup selection, along with a volume knob and two tone knobs. The pop-in tremolo arm was upgraded for enhanced stability. Often, there is a challenge finding that right balance of the arm being too loose or too tight. The pop-in style solves this problem by utilizing an arm tension adjustment to set just the right swing in the arm. The bridge is a standard American, two-point design, and the bridge saddles are vintage bent steel. The case that comes with the guitar is Fender’s Elite Molded Case. It features upgraded latches compared to previous models, is supposedly more durable for travel than classic hard cases, and has TSA compliant locks. The American Professional Strat was perfectly set-up right out of the box. After tuning it up and stretching the strings, the guitar played very well. The guitar immediately felt durable and properly balanced off the shoulder as with typical Fender Strats. One thing that we always feel that should differentiate an American-made guitar from a less expensive foreign made one is that it should come with perfect frets and require little set-up. The guitar that we reviewed had well-dressed, rounded fret edges with no sharp edges, near perfect intonation, and the neck had just the right amount of bow. The back of the neck was covered in a matte satin urethane finish that made moving along the neck clean and smooth. The fretboard was covered in a thick glossy urethane, which we found less desirable as it could sometimes feel sticky under hand when bending notes. However, the new, narrow-tall frets counteract this a bit to make bending notes easier than on the previous series Strat. The nut was upgraded to genuine bone vs. synthetic bone as found on the outgoing American Standard guitars. Some claim this improves tone as bone’s higher density transfers vibration better for increased resonance of the guitar, but any theoretical difference went unnoticed by us in real-world playing. The tuners seemed smooth and once the strings stabilized, the guitar stayed in tune well. The new, “Deep C” neck shape offers a nice refinement, and it feels like a happy meeting point between Fender’s modern C and D shapes. The slight change seemed more comfortable in our hands, particularly at the 12th fret and above, and there was no fret buzz nor fretting out with aggressive bending. Having a Strat’s whammy bar stay in position (courtesy of the adjustable collar) while not being too tight was a joy. Even after minutes of use, the guitar stayed in tune. You probably won’t be doing Van Halen dive bombs with it, but for most whammy bar use, the guitar was able to keep up. One other key difference we noticed was the resistance of the pots for volume and tone control. Depending on your playing style, it can be easy to hit the volume or tone knobs and have them move while playing. No longer! These pots seemed to have just the right amount of resistance, avoiding being too loose, while also not being too tough. The guitar does appear to be a little bit of a hodgepodge of modern and vintage styles. The pickup covers and volume and tone knobs are tinted, and there are vintage bent-steel bridge saddles. We think a vintage style string tree and tuners would fit better with the overall vibe of the guitar given those design choices, but the combination certainly works from a functionality perspective. Feeling how the sound of an unplugged electric guitar resonates through your bones acoustically sets the stage for what you should expect once plugged in. This particular guitar we reviewed sounded fantastic acoustically. It had great resonance. Whether that’s in part due to the real bone nut or the light weight of this Strat body is hard to say. Now of course all of this doesn’t matter if a Strat doesn’t sound like a Strat. Most guitarists looking for a Stratocaster are looking for the glassy clean sound, powerful blues tone, and all-out rock belt. You’ll notice from the pickup diagram above that the bridge pickup is the only one of the three without a blended magnet. It is pure AlniCo 5, which is supposed to be punchy and bold, but we felt that it came across a bit harsh, one of the familiar critiques of Strat bridge-position pickups. However, rolling off the tone control improved the tone quite a bit and made the first pickup position more usable. The rest of the pickups delivered expected Strat tones, but lacked a bit of the expected glassiness. Putting a Creative Audio Labs Redeemer buffer in the circuit before our guitar cable definitely improved the tone and enhanced the sound of the pickups. These are not noiseless pickups. In positions 2 and 4, you get the expected out-of-phase tones that are noiseless, but positions 1, 3, and 5 present typical, modern single-coil noise, which is to say, they’re not as noisy as your father’s Strat, but the noise is still present. If you desire classic Fender Stratocaster tone with all the sparkle and none of the noise, check out the American Elite series, which features the fourth-generation noiseless pickups (reviewed here). We started testing the guitar on a Supro Dual-Tone amp. The combination of a Stratocaster and a Dual-Tone gives way to some classic tones. The amp really thrives when cranked all the way, giving a fat but clean and punchy crunch. Since this guitar has a treble bleed circuit, it’s a perfect candidate to have the amp cranked and the guitar volume knob rolled down. There are many discussions about upsides and downsides of treble bleed but it is a great (and inexpensive) mod that makes the volume control more usable. Although many guitarists leave the volume knob set at 10 all the time, adjusting it can broaden the range of capabilities of the guitar. The treble bleed mod really made use of the volume knob a pleasure for more than classic volume swells. In all positions, the guitar thrived with this amp, but did seem to lack some of the glassy Strat character we desired. Next, we played it through a Blackstar HT Studio 20 with a Weber Blue Dog speaker. This amp is very versatile and can be used to get clean, glassy, Fender tones as well as full blown, rockin’ Marshall-like distortion. On the clean channel, we were able to get classic Strat tones, but again, lacked some of the glassiness. But on the dirty channel, we felt there was a certain muddiness trying to play high-gain, distorted tones. Rolling back the tone knobs on the guitar helped a bit. This was particularly noticeable when we tried various distortion/overdrive pedals. Rolling back the tone control with the bridge pickup can help achieve a more humbucker-type tone and reduce and/or eliminate most of the harshness typically found with the bridge pickup on a Strat. We did find that rolling back the tone knob all the way to get that Clapton “Woman tone” (he wasn’t using Stratocasters for most recordings back then) resulted in too muddy of a tone, and the tone knob was not useful below 3. Cranking the distortion all the way up on the amp without pedals, the lower output of this bridge pickup couldn’t drive the amp hard enough to achieve our desired hard rock/modern high gain tone, where a humbucker or hotter single coil pickup would typically be preferred. We also tested the new Strat with apps on our iPad using an Apogee Jam interface. Interestingly, all the pickup positions were very quiet. So if you are using the guitar straight into an interface on your computer or mobile device, you may find the pickups to be beautifully quiet across all positions. We had no trouble getting excellent hard rock/high gain tones, and rolling down the tone knob to 6-7 on the bridge pick-up really helped reduce the harshness. Our results varied across the different amps, more so than the consistency we’ve achieved with the numerous other Fender Strats in our collection. The Fender website is a comprehensive resource for most things that are needed including videos for set-up, intonation, truss rod adjustment, etc. There is also a very general manual in English and Spanish that covers warranty information. However, only the Spanish part of our manual included any setup information. The guitar comes with a certificate of authenticity. There are two Allen wrenches for truss rod and bridge saddle height adjustments. This Fender American Professional model sells for $1,399.99, while certain finishes and wood choices sell for $50 to $100 more. There are also HSS and an HH configured models at similar price points, useful if you’re seeking to play a new Strat in high-gain settings.